Ping Fu at the 10,000 Year Clock Site waiting for a laser scan to complete. We are pleased to welcome Ping Fu to the board of The Long Now Foundation. It was just last year that Ping joined Long Now as a member, and we discussed the possibilities of laser scanning some of the work we were doing at the Long Now Clock site. 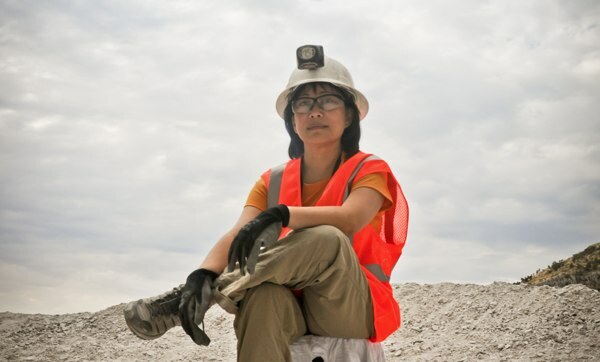 She is the founder of Geomagic Inc. a company that makes software to visualize and analyse laser scan data. Just a few weeks later we found ourselves standing at the top of a mountain in West Texas looking down the 500 foot deep raise bore. Since that time she has attended several of our seminar events, and helped to connect us to her amazing network on a variety of fronts. In general she was already acting as a board member, so we had to extend an invitation to join us. Below is a bit more about her amazing story and career. Welcome Ping. Honored in 02005 by Inc. Magazine as “The Entrepreneur of the Year”, Ping Fu describes herself as an artist and a scientist whose chosen expression is business. In 01997, Ping co-founded Geomagic, a software company which pioneers 3D technologies that fundamentally change the way products are designed and manufactured around the world. Used for repairing vintage cars at Jay Leno’s garage to digitally recreating the Statue of Liberty, Geomagic aims to enable design and production of one-of-the-kind products and services at a cost less than mass production. Before co-founding Geomagic, Ping Fu was program manager of Visualization at the National Center for Supercomputing Applications, where she initiated and managed the NCSA Mosaic software project that led to Netscape and Internet Explorer. She has more than 30 years of software industry experience in database, networking, geometry processing, and computer graphics. Since 02010, Ping has been serving on the NACIE (National Advisory Council on Innovation and Entrepreneurship) board at the White House and is a member of NCWIT (National Council on Women in Technology (MP3). Ping was recognized in 02012 by the U.S. Citizenship and Immigration Services as an Outstanding American By Choice. She also participated in the kick-off for the White House’s 02011 Startup America initiative, is the author of two books in Chinese and inventor of five US and international patents. Ping has received numerous awards for her leadership as an entrepreneur, including Entrepreneur of the Year by Inc. magazine, Ernst & Young Entrepreneur of the Year for the Carolinas, Woman’s Compass award and Life Time Achievements award by Business Leader magazine. She was invited as a guest of the First Lady Michelle Obama at her box for the President’s first State of Union Address in Jan. 02010. You can listen to Ping in her 02011 interview at WUNC, and 02006 interviews for National Public Radio. Coming straight to the US from a Chinese prison, Ping’s journey (MP3) to entrepreneurship is a remarkable American dream by itself. Her childhood dream was to be an astronaut. Today her company’s software is used to ensure safe return of every NASA space shuttle. “There is a deep current of humanity in the way we approach innovation and business” she says. Ping has one daughter and lives in Chapel Hill, North Carolina.